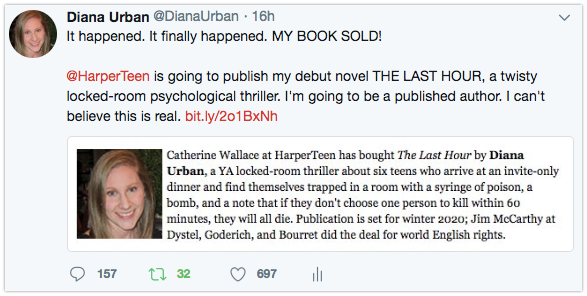 My debut novel The Last Hour will be published by HarperTeen in 2020. It's a twisty locked-room psychological thriller; I hope you love it. I hope you're having a great week! I have such exciting news to share with you. My debut novel The Last Hour will be published by HarperTeen in 2020. It's a twisty locked-room psychological thriller, and I'm absolutely thrilled it's found a home at such a stellar imprint. I can't believe this is real! And here's a link to my Twitter announcement. So what's The Last Hour about? Seventeen-year-old aspiring film score producer Amber is convinced she's going to die tonight—from nerves, that is. She'll be trapped at a scholarship dinner with the boyfriend she plans to dump and the nerd crush who'd take the blame—and a blow from her boyfriend's fist. But the scholarship is a ruse, and when an unseen captor locks her and five other students in the deserted restaurant, they find a note, a syringe filled with poison, and a bomb. The note reads: "Within the hour, you must choose someone in this room to die. If you don't, everyone dies." Determined to get everyone out of the room alive, Amber orchestrates friends and foes alike to work together to find a way out—and keep the tension with her selfish boyfriend from imploding. But as she grapples with the clashing personalities of her almost-ex, her former best friend, the queen bee, the stoner, and the nerd, the bomb's timer ticks down. Confusion turns into fear, and fear morphs into panic as they race to uncover who locked them in… and who's going to die. This was the most challenging book I’ve ever written. It’s a dual-timeline deconstructed murder mystery, with alternating flashback chapters dropping clues about whodunit and who the victim will be. It also tackles some heavy themes, including bullying and revenge. I have never been prouder of a project, or more excited to share my words with readers. Again, I'm thrilled to share this news with you, and I'll have plenty more updates over the next 1.5 years in the lead-up to The Last Hour's launch. As part of my VIP list, you'll be the first to know about book updates and giveaways, and I'll share behind-the-scenes looks at The Last Hour. I'm SO grateful to have you along for the ride. For now, you can read more about my publishing journey (it's been a long, long road) and exactly how I landed my book deal by reading the full announcement on my blog. Also, if you'd like to receive more exclusive updates on Facebook, you can join my Reader Group! Hope to see you there. You received this email because you are subscribed to Diana Urban's VIP List from Diana Urban .